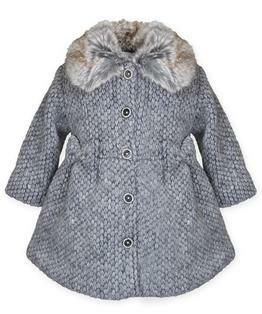 The warmth of wool with the snugness of a sweater, moms say this coat is smart and kids say it is stylish. Exquisitely crafted in charcoal gray wool blend with coordinating super-soft faux fur lining, it flairs from the waist with two perfect matching bows. 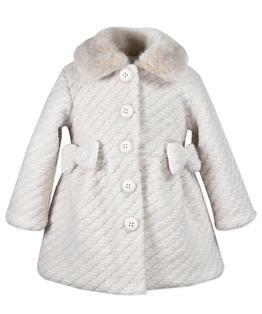 It is topped off with a luxurious cinnamon-and-cream faux fur collar and five buttons to fasten. Side-seam pockets are fully lined. Sizes 6M - 8. Hand wash. Do not wring or twist. For best results, dry clean. Faux Fur Collar Coat. Hidden Snap Closure. Faux Fur Lining. Polyester/Wool. Hand Wash Recommended. Can be Machine Washed. Imported.